We coated these timber braces with a durable low VOC exterior wood finish, which we are also happy to be able to supply to our clients and other contractors. Standard solvent-based wood finishes are harmful to the environment and to human health, and they use non-renewable petrochemical ingredients. 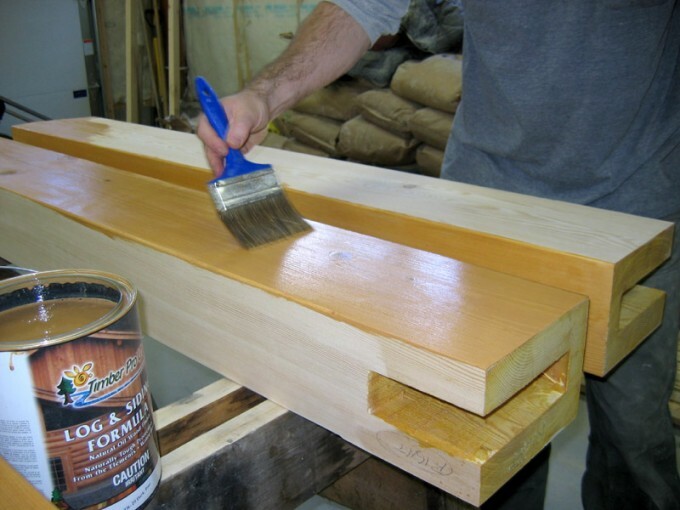 We decided to start using and distributing Timber Pro Coatings, because it is a great green building alternative to conventional wood stains. Timber Pro makes its products from primarily bio preferred plant-based oils blended with a small percentage of acrylic to boost durability. Water borne rather than solvent-based, these finishes have low VOC content and use renewable resources. These products are “green” building alternatives, and generate LEED credits. You can read more about the various finish options at their web site www.timberprocoatings.com and you can contact us at TRC Timberworks if you would like to hear about our experience with the products or to try some samples for a project.